Members of Kiel Evolution Center discover fundamentally new traits in the inheritance mechanisms of a plant-damaging fungus. Wheat is the world's second most extensively cultivated cereal crop, and in many countries an indispensable ingredient of essential staple foods. In Germany alone, 20-25 million tons of this grain are harvested per year. However, wheat cultivation in north-western Europe faces a fungal pest, which in extreme cases can cause losses of around 50 percent of the harvest. The fight against the fungus Zymoseptoria tritici is therefore of fundamental importance for food security. Disease management has so far mainly occurred in the conventional way through the widespread use of fungicides - with all the associated disadvantages for the environment and consumers. Because the fungus is becoming more resistant to fungicides and, conversely, there are no wheat varieties that are completely resistant to the pest, scientists at Kiel University (CAU) together with colleagues worldwide are intensively researching sustainable ways to keep the fungus in check. At the CAU, the Kiel Evolution Center (KEC) in particular is working on applying evolutionary biological principles and making them usable, among other things, for pest control. An important step in this direction has now been taken by a KEC research team, together with the Max Planck Institute for Evolutionary Biology in Plön (MPI-EB), through their investigation of the basics of inheritance in this harmful fungus, and thereby also potential ways to combat it. The Kiel researchers discovered that the so-called meiosis, i.e. the maturation division of germ cells and the associated multiplication of genetic information, occurs differently in Zymoseptoria tritici than previously thought. This fungus has additional, unpaired chromosomes that can pass on genetic information to all their offspring and not just half of the following generations. "We have found that the chromosomes, but not the fungus as a whole, gain an evolutionary advantage through this type of inheritance," emphasised Dr Michael Habig, first author of the study and research associate in the Environmental Genomics group at the CAU Botanical Institute. "Only the chromosomes themselves benefit by passing on their characteristics to all descendants, and thus in a figurative sense they act egoistically," continued Habig. 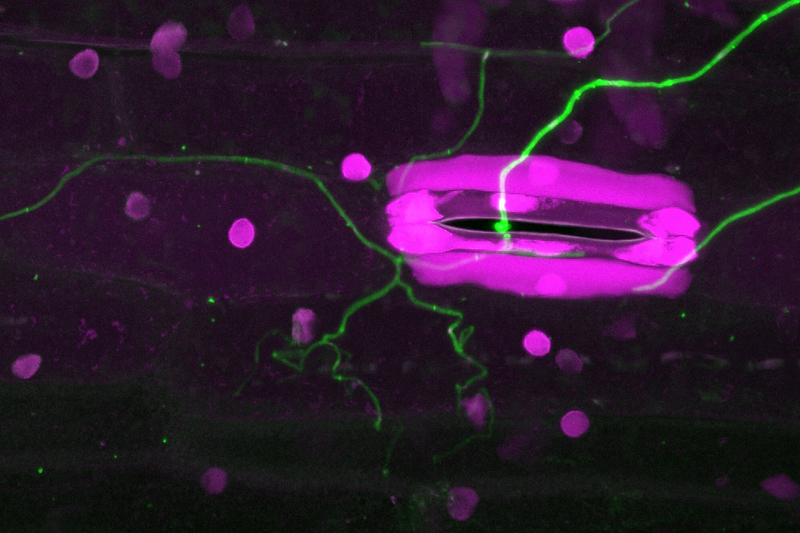 The researchers described this phenomenon in Zymoseptoria tritici for the first time, and recently published their results in the journal eLife. Meiosis - an old acquaintance from biology class? At the centre of the newly-described inheritance process is meiosis, which is a key step in sexual reproduction, and apparently takes place fundamentally differently in this fungus than previously thought. In normal so-called Mendelian inheritance, it serves to combine the different maternal and paternal chromosomes in the form of so-called homologous chromosomes, and pass these on to the descendants. In this way, the offspring inherit half of their genetic characteristics from both the mother and father. In contrast, meiosis seems to take place differently in Zymoseptoria tritici - especially regarding the so-called supernumerary chromosomes, which cannot combine with the relevant paternal or maternal counterpart. These unpaired chromosomes are thus inherited exclusively from either the mother or the father. The researchers were able to demonstrate that the maternal supernumerary chromosomes are passed on to all descendants, and not as expected only half of the descendants. "The driving force behind this strategy is the so-called meiotic drive, which ensures the increased transmission of chromosomes to the next generation," emphasised Professor Eva Stukenbrock, head of the Environmental Genomics group, which is jointly based at the CAU and the MPI-EB, and board member of the KEC. "This alternative method of inheritance was already known from other organisms. We could now prove it in Zymoseptoria tritici, and have found very many of the chromosomes involved in this meiotic drive," continued Stukenbrock. For the organism as a whole, inheritance through supernumerary chromosomes seems to be mainly a negative process. Why the fungus has nevertheless retained this in the course of evolution, over a long period of time, has not yet been fully understood. On the one hand, it inhibits the fungus’ ability to infect wheat, but on the other hand possibly increases its ability to adapt to changing environmental conditions. However, the Kiel researchers particularly see the chromosomes’ egotistical strategy as offering potential for new means of combating the harmful fungus in future. "Perhaps we will be able to introduce specific genetic information into the fungus through this special type of inheritance, which could substantially reduce its harmfulness to wheat," Habig said optimistically. "In doing so, one could take advantage of the fact that all offspring will be equipped with the corresponding genetic information," added Habig. The methods required to do this, such as so-called genome editing, are currently being intensively researched worldwide. So in future, the principle discovered at the KEC could help to permanently protect wheat plants against attack by Zymoseptoria tritici. Caption: A wheat leaf infested with the fungus Zymoseptoria tritici shows the typical signs of so-called leaf blotch, which can lead to drastic crop failures. Caption: Confocal microscope image of the infection of a wheat plant: the fungus penetrates the stomata of the leaves, and can spread between the plant cells. Confocal microscope image of the infection of a wheat plant: the fungus penetrates the stomata of the leaves, and can spread between the plant cells. 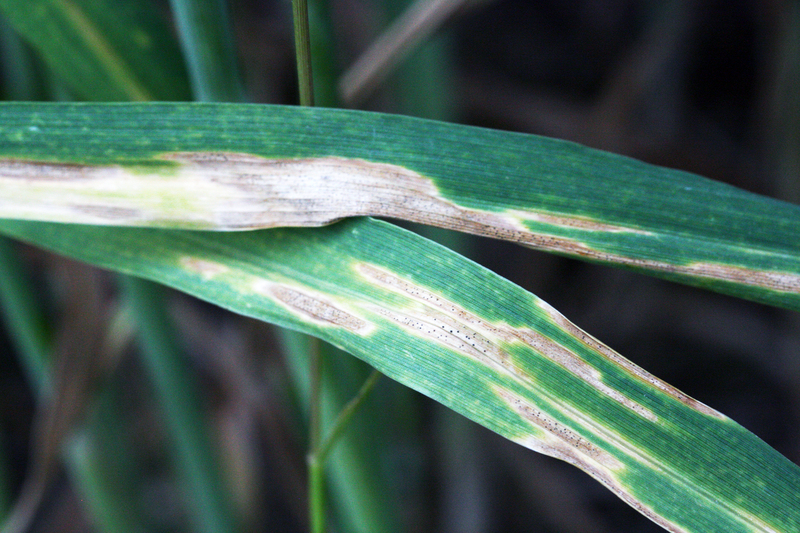 A wheat leaf infested with the fungus Zymoseptoria tritici shows the typical signs of so-called leaf blotch, which can lead to drastic crop failures.